In 3-quart saucepan, heat water, salt and corn to boiling. With wire whisk, gradually beat in grits. Return to boiling, beating constantly. Reduce heat to low; cover and simmer 5 to 7 minutes, stirring occasionally, until thickened. Remove from heat. Stir in onions and cream cheese until well combined. Cover; keep warm. Meanwhile, in 10-inch heavy skillet, melt butter over medium-high heat. Add garlic; cook and stir about 2 minutes or until lightly browned. Add shrimp; cook and stir 4 to 6 minutes or just until shrimp are pink. Stir in seafood seasoning, chipotle chiles and tomatoes. Reduce heat to medium; simmer uncovered 2 to 3 minutes or until tomatoes are thoroughly heated. 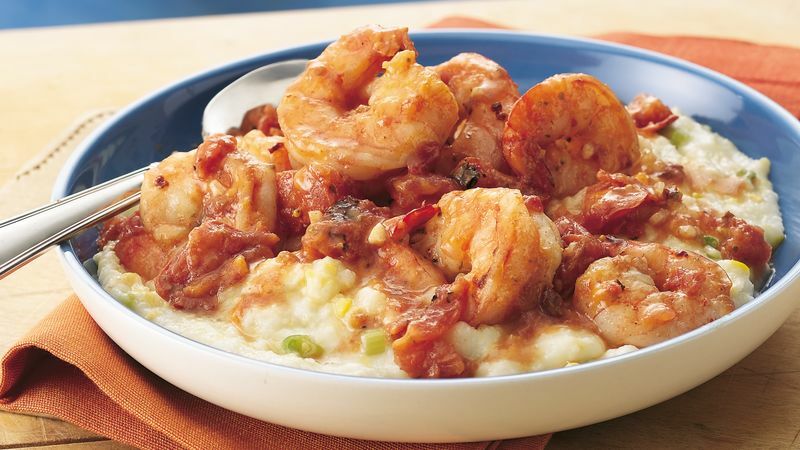 Divide grits mixture evenly among individual large soup bowls; spoon shrimp mixture evenly over top.